The ecommerce applications have made it easier for businesses to offer their products and services to customers residing on various regions. But the businesses have to make changes to the web store frequently to attract and engage the website visitors. Often minor changes made to a web store affect its functionality and performance hugely. That is why, most businesses use a variety of tools and frameworks to test their ecommerce applications quickly and efficiently. The test automation tools further help testers to perform the required tests repeatedly and frequently without putting extra time and effort. But each business must focus on a number of key points to automate ecommerce application testing effectively. Before automating your ecommerce application testing, you must identify and address the key challenges related to functionality, security and performance. You must check the website thoroughly to ensure that the visitors can find and buy the required products quickly. Likewise, you also need to check if the website can effectively handle a higher number of visitors and online transactions efficiently. Also, the application must allow customers to perform online transaction with utmost privacy and security. The key challenges will help you to decide the appropriate test coverage. When you decide to automate ecommerce application testing, it becomes essential to invest both funds and resources. So you have to make a plan based on several requirements. In addition to setting up a budget for the test automation project, you need to schedule the testing efforts and define the objectives to be achieved in each test cycle. At the same time, you must define the scope of each testing to ensure that all aspects of the web store are covered. The initial planning will help you to save both time and cost in the longer run. The initial planning will further help you to decide the types of tests to be conducted and scope of each type of testing. But each process in an ecommerce application needs to be tested based on specific functionality, action and validation criteria. For instance, you have to test user login, search functionality and shopping cart based on different criterions. That is why, it is important to figure out requirements for testing each process, and prioritize the requirements. Based on the prioritized requirements, you can decide the tests that need to be automated. The quality of the test automation framework will have a direct impact on the outcome of the test automation project. So you must design a comprehensive test automation framework by covering all automated tests. The framework must include the test scripts and the scenarios of various automated processes. Based on the framework, the testers can easily execute the tests, and obtain relevant results by generating test reports. After designing the test automation framework, you have to pick the right test automation tools based on the type, scope and requirements of testing. As the tools selected by you will have a direct impact on the test automation project, you must choose the tools based on a number of key parameters. It is always important to compare the available tools based on key parameters like features, performance, extensibility, licensing cost, maintenance cost, and required training. You must take advantage of many open source test automation tools to automate more testing efforts without investing additional funds. The popularity of each ecommerce website nowadays depends on its user experience. So each test scripts and processes must focus extensively on user experience. You must decide the tests to be performed based on the nature and types of changes made to the ecommerce application. At the same time, the testers must repeat all tests to ensure that the changes made to the application do not affect its user experience. Likewise, they must repeat all tests to ensure that the application delivers quality experience across many devices and platforms. On the whole, each business needs to implement a comprehensive and customized strategy to automate ecommerce application testing. However, it is also important for the business to pick the right test automation tools to check all aspects of the web store quickly and effectively. This entry was posted in automation testing, Uncategorized and tagged automation software tesing, automation software testing, automation testing company, automation testing team, ecommerce automation testining, experts in software testing, qa test automation, test automation. Since it has been brought into light and people have slowly gained knowledge of the software testing procedures, it has become one of the vital parts of the whole software development life cycle which strives to provide better and bigger software to the customers leading to better customer satisfaction and preventing all the possible glitches that could have caused customer dissatisfaction. This in turn has ensured that the mega minds of software technologies pay better attention to the software testing procedures which has paved way to test automation tools in place of manual processes by which software testing was initially done. In the current days, automation tools have taken up a large portion of the software testing procedure and replaced the manual testing process at large. With the constant advancements, customized automation testing tools are now being produced in order to provide more optimal results to the whole testing scenario. But what next? But before getting into the future of the test automation tools, we need to look back on the huge changes that have been brought about in the UI interfaces. The CRT monitors have now been replaced by the LCD ones, no longer can you see big, space consuming laptops, and people are now fond of small portable devices which are efficient at the same time. This has paved the way for mobiles and tablets which has now become the platform of development as well as testing of the various software. Along with the devices, there has also been a huge change in the internet which has become far more accessible and easy to use. All these changes have affected test automation tools hugely. Test automation tools are now being programmed in order to support these new and developing UI interfaces and technology. With the development of newer software is coming the requirement of developing newer test procedure to test them and free them of the ever advancing bugs which are also striding towards the future. With the advent of newer testing procedure, people are finding the need of test automation tools to cope up with this change. Plug-in Manager: The whole system has to be supported by various plug-ins that will contribute to the whole system. This should also ensure that the addition or removal of a plug-in would not affect the set of core plug-ins and the whole system wouldn’t have to be restarted for normal operation. Discovery: The newly developed test automation tools should be able to use the already using codes and discover them in a new fashion which will be useful in the future. Reverse engineering is to be used for the benefit of the suture of test automation tools. Execution and Reporting Engines: Execution and reporting engines are to be introduced which will increase the flexibility in the method of testing of the various software as well as help in the consolidation of the various results available from the different tests performed. This was in short a look into the future of test automation tools which is going to be introduced into the world of software testing in the very near future to ensure the betterment of quality of software and profitability of the organizations. This entry was posted in automation testing, test automation, Uncategorized and tagged automation software testing, automation testing company, automation testing team, experts in software testing, mobile automation testing, qa test automation, test automation, types of software testing. Software testing procedure is the key to the success of any software application and it is a proven fact. The software which undergo software testing procedure prior to launching has better customer satisfaction and success rate than their counterpart which was released without any testing. This is because software testing helps in detection of the various flaws that may ultimately result in the dissatisfaction of the customers. The detection of these flaws helps the developers to rectify them and make the software a stronger one. Automated testing or test automation is a part of the software testing procedure where the certain pre written codes or special software which automatically test the software under examination and provides the tester with the results and at times can also compare the results of a current test with a past one to show the improvements made on the software after rectification or to give an idea about the most persistent problems that have been lingering on for quite some time now so that special heed may be given to these problems. Automated testing helps in betterment of the software being tested which in turn leads to the success of the same. But before deciding whether test automation is the key to the successful application or not, first let us check out the various benefits of test automation. Testing Improves Accuracy: Monotonous software testing leads to mistakes. Even the most experienced and professional tester is prone to committing mistakes when they are performing manual testing for a long period of time. This can be avoided completely with the help of test automation as it is conducted by the machines and can run the same tests for hours at a go without a single mistake and same consistency. Increase Test Coverage: Test automation increases the depth of testing procedures along with the scope. While manually testing a software, testers often omit the lengthy tests for obvious reasons of time. Test automation helps in conduction these tests. Also test automation can take a peek into factors like memory contents, data tables, file contents, and internal program which are usually surpassed by manual testing to provide a detailed report of whether the software at stake is performing in a desired way or not. 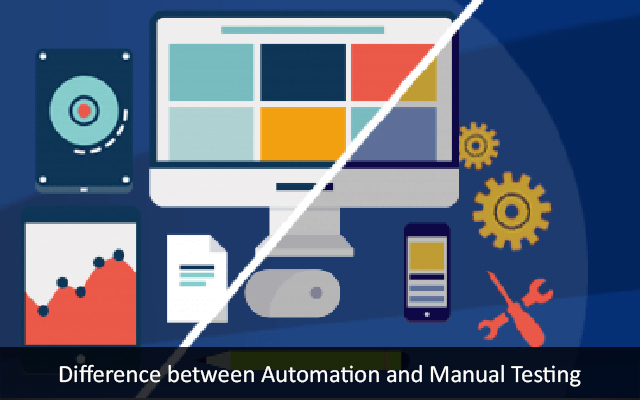 Automation Does What Manual Testing Cannot: Controlled web application test with the help of thousands of users is something which can only be achieved by the help of test automation. It can create scenarios of tens or hundreds or even thousands of virtual users who will be using the software at the same time. This is something which can never be achieved by manual testing methods. Automated QA Testing Helps Developers and Testers: As test automation is conducted by machines so even developers with little knowledge about software testing will be able to conduct them. This helps them to rectify the preliminary errors before sending them for software testing which helps in saving time and effort on both fronts. Team Morale Improves: This is quite obvious. Test automation takes care of the monotonous and time consuming jobs which leave the team members free for attending the more challenging jobs and for developing better testing procedures which will provide them with more accurate results about the working of the software thus helping them to make even better software. Thus you can now see that it is pretty evident that test automation hugely enhances the chances of success of an application by improving it in terms of quality leading to greater customer satisfaction. This entry was posted in automation testing, test automation, Uncategorized and tagged automation software tesing, automation software testing, automation testing, automation testing company, automation testing team, experts in software testing, outsource software testing, qa test automation, software testing company India, software testing service, software testing tools, software testing types, types of software testing. The automated testing is the present and pretty much the future of testing. Most of the tools used for automated testing in JAVA apps are open source, those derived from Junit. But these tools vary from sector to sector depending upon the business purpose and validation components. JAVA apps are one of the most popular things on the internet. The internet is flooded with these apps. But what are the tools which help creating and making the JAVA app as good as it is. There are various tools available in the market,which play a crucial role in testing for such apps. JSF: JSF is an integral part of a web-based framework for User Interface development. The standard reusable components can be easily used to create a UI. Java Server Faces containXML, Bean & other tags. XML: XML is another extension of Junit. The unit performs validation of XML structure and comparisons between the actual and expected XML is made. EJB: The Enterprise JAVA Bean is basically revolving around the Business logic. JunitEE could be used for the EJB based projects though the JUnit is still the most popular choice. Karma: Karma is one of the most popular testing tools for Angular application. It is maintained by the Angular team at Google. It runs various test cases and files with the configuration of karna.confs.js and displays the result via the command prompt. WATIR: Watir is a popular web application testing tools developed in Ruby. It requires the tester to have a fair knowledge about its language Ruby and all the functions that are required to be performed are written in Ruby. Swing: Swing comprises of a set of libraries in JAVA to create a rich GUI. Among the popular unit testing frameworks are the frameworks such as Abbot, UISpecs4J, Fest, QF-Test. These were the top 10 tools for automated testing of Java apps. Share other tools, if you any, below in comments. This entry was posted in automation testing, automation testing services, Uncategorized and tagged automation software tesing, automation testing company, automation testing team, experts in software testing, outsource software testing, qa test automation, test automation. Most of the large organizations these days are in favour of outsourcing the QA department to a specialized organization so that their team can concentrate solely on the developmental features of the product. As the software testing procedure is a prime factor in the success of the software and hence its popularity, choosing a good QA testing partner for your firm is of utmost importance. 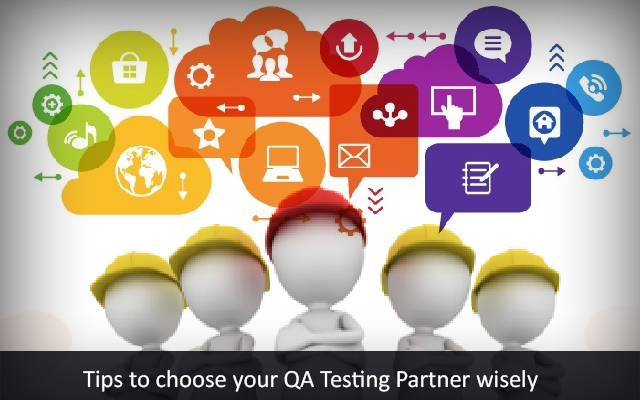 The following tips will lead you to a wise selection of QA testing partner. Look at their Client Portfolio and Testimonials: One of the best ways to judge the work of an organization is by reviewing their past works. Their portfolio will give you the various works that have been done by them which will show how experienced and skilled the workers are and then you can judge whether they will be able to fulfil you criteria or not. Software development is a vast region and your QA testing partner should be able to provide you service irrespective of the topic you work in. Cross-Cultural Compatibility Study: Many IT companies are now choosing QA partners at a country which is different from where the development team hails from. In such cases, it is absolutely necessary that the management pays close attention to the cultural, social, economical and political situation of your partner country. Also check out if other companies are outsourcing their work to the country you have selected. If a large number of other companies have selected your choice, it simply shows that you choice deliver trustworthy services. Cost of Contract: When you are in a business organization, your primary concern should be profit of the organization. Outsourcing the QA department often helps in saving funds ultimately adding up to the profit of your company. While choosing a QA testing partner, you must take notice of the cost at which the service is provided. Offshore QA testing partners (especially in the Asian countries) offer highly skilled labours at cheaper rate than in USA or UK. Work with Project Management and Collaboration Tools: Most of the large QA testing firms usually work with project management and collaboration tools in the first place. However, as precaution is always better than cure, you should be clear on the terms that your partner should use project management software like GIT and collaboration tool like MediaWiki or Collaboration in order to yield better results out of the testing procedure. It also makes the procedure easier and a lot faster. Insist on a Project Manager: When you are selecting your QA testing partner, you must make sure that your project is being handled by a senior official who is experienced in his job and is capable of taking major decision as and when required. If your project is being handled by a novice, chances are that it may go haywires due to the lack of experience and leadership qualities of the same. Proper Documentation: Detailed documentation of the work that has been done by your QA testing partner is an absolute must as it will help you in future references. These pointers should suffice to help you to choose a good QA testing partner who will help you to prepare a better product that will gain customer satisfaction, ultimately leading to the goodwill of your company. This entry was posted in automation testing, automation testing services, qa testing, qa testing services and tagged automation testing company, qa test automation. Although software testing is one of the most important phase of developing your software, it definitely doesn’t come under the core developmental area and can be easily outsourced. The process of outsourcing the method will help you to relieve the pressure of the process so that you can focus completely on the functionality and performance of the software. In present day, India holds 40% of the total outsourced services and the following reasons are exactly why India is your best choice to outsource software testing. Pay Less, Get More: The main aim of any business is to gain maximum profit and benefit out of the existing staff which is at your disposal. When you outsource a part of your project to a place like India, you get your core team to manage the outsourced lot and it will help them to focus well on their part of the job as it will relieve the pressure. You can also get the job done at a cheaper rate and hence increase the net gain of the company in terms of money and also in terms of staff productivity. Skilled People, Cheaper Rates: One of the top notch reasons why most of the leading technological companies are choosing India for the purpose of outsourcing the software testing is because you get highly skilled people at your disposal. You get the service of these skilled people for much cheaper rates than you would get at your home grounds. This ultimately ensures that your ultimate cost is cut down improving the profit of your company yet you get the same quality of service as you would get in your hometown. In India you will get perfect product satisfaction from the workers. Focusing on Core Business: Many large companies have a software division as a side dish of their main business. On one hand, you need to produce the best software for your customers, but on the other hand, you also need to focus more on your actual business. Outsourcing the side business to India will make sure that you get high quality product to serve to your customers and at the same time you will also get to keep your staff focused on the main business that you own. Negotiable Pricing: As we have already said, India offers a much diminished pricing range for the same quality (sometimes better) job as in USA or UK. Thus, outsourcing your testing part of your software to India will save a lot when it comes to money and will show a huge profit on the annual report of your business. Where any labour in the US will cost you around $80 per hour for full time software testing project, an Indian counterpart might only cost you $25 per hour for the same job. See the difference? Easy Start Off: As India is one of the giants when it comes to outsourced jobs, holding around 40% of the net outsourced job in the world, finding a perfect company to outsource your job to is very easy out there. All you need to do is take care of the various criteria you have, choose a vendor according to your required terms (which is pretty easy as the country is loaded with such vendors) and sign a contract with them and voila! You have now outsourced the software testing to India. Yes! It is actually as simple as that. 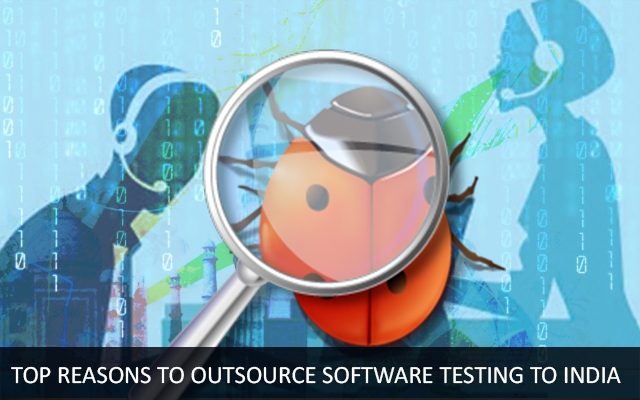 So, now that you know about all the benefits you can get from outsourcing the software testing to India, you should immediately consider doing so. This entry was posted in automation testing, Software Testing and tagged automation software tesing, automation software testing, automation testing company, outsource software testing, software testing company India, software testing service, types of software testing. Software testing is one of the most vital parts of the software development life cycle, which solely decides the popularity of the developed software. As the testing processes are advancing, IT organizations are becoming more aware of its importance. Although multiple kinds of tests are available in the software testing the whole software testing procedure can be broadly classified as automated testing and manual testing procedure. As the whole software testing is based on these two parts, it is very important to know the difference between the two so that one can apply the right test in the right situation. Automation Testing: Automation testing is the type of software testing procedure which is conducted with the help of testing tools like Selenium, J meter, QTP, Load Runner, Win Runner etc. Which are usually open source in nature and help the testers to perform various phases of the software testing life cycle. Automation testing is considered to be an integral part of manual testing,which takes lesser time due to the fact that they are done with the help of running scripts. Usually in the automation testing process the recitative functionalities of the software are checked solely by using tools. The regression testing is a lot less complicated with this procedure (due to the utilization of various tools) and more accurate and reliable results are obtained with the help of less number of testers. These tests are of high quality and can be done in multiple batches at the same time. You can also run automation tests on more than one machine at the same time. However, automation testing has some down sides which lies basically in the fact that it is an expensive procedure where knowledge of programming is absolutely necessary. Manual Testing: The type of software testing, which is done primarily by the testers without the use of automatic tools or scripts is known as manual testing. Although it is accomplished primarily by the human beings, it consists of some of the most important phases of the software testing life cycle, which includes the likes of test planning, test deployment, result analysis, test execution, bug tracking and reporting tools. Although the processes of manual testing is a lot more complicated and time consuming, still it helps in the detection of a lot more bugs as the tests performed are random in nature and the testers are allowed to use their instincts for the detection of flaws. Random testing and Error guessing are two of the basic processes by which the manual testing results are obtained. As the use of tools are limited to this type of testing hence regression testing procedure becomes pretty complicated and hard to grasp and takes a lot more time to obtain the results. As there is practically no tool interaction with the manual testing process, hence it requires a lot more testers to get the work done and batch testing is impossible. The results obtained may be less accurate and reliable but the process is a lot less expensive and requires no knowledge of programming to be accomplished. So these are the overall basic differences between the manual and automation testing of software. You can now decide which test would be best suited for your project and work accordingly. This entry was posted in automation testing, automation testing services and tagged automation software tesing, automation testing company, automation testing team, mobile test automation, qa test automation.